Things in life are interesting and important to the degree that they relate to other things because, basically, most things in life—ideas and people—are connected, if not immediately then eventually. This credo makes sense to him back at Hope, too. The interdependence of subjects and people on each other is a fundamental aspect of a Christian, liberal arts education, after all. 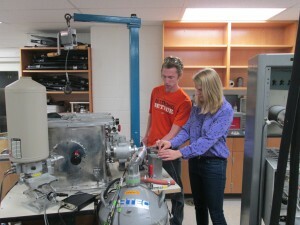 Dr. Jonathan Peterson in his Schaap Science Center lab located on the campus of Hope College. Peterson, the Lavern and Betty DePree VanKley Professor of the Geology and Environmental Science, and a firm believer that all life-matters are interrelated, likes it that way. At ORNL, Peterson’s break-away shifted to intense research. Though he was the resident director of the GLCA Oak Ridge Science Semester in the fall, he conducted his own research for the full academic year, too, using cutting edge technology at a world-class facility while collaborating with world-class scientists. ORNL, first established in the early 1940s as part of the U.S. government’s Manhattan Project, is the Department of Energy’s largest facility conducting research to find “transformative solutions to compelling problems in energy and security.” Research productivity is critical there as individual ORNL scientists—well over 3,000 in more than 100 disciplines—published their findings six to eight times each year. 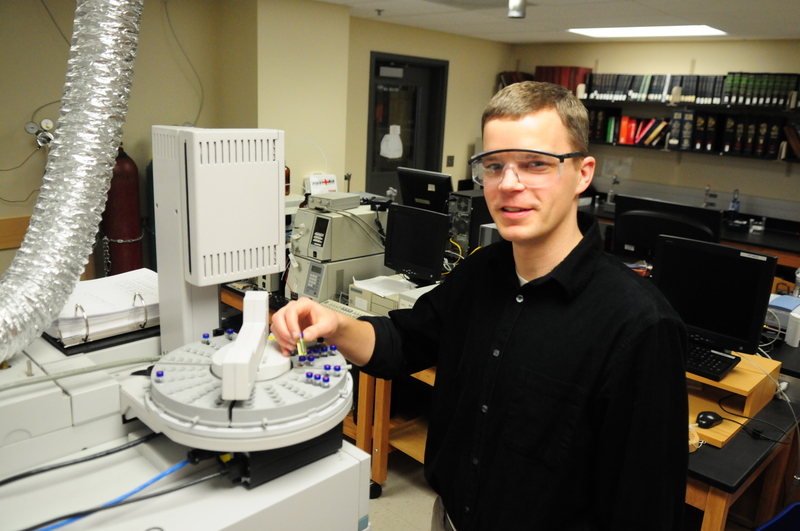 Peterson’s research analyzes how antibiotics breakdown in the presence of titanium oxide nano-particles. In and of itself, this could seem like a subject highly obscure and literally minute. Yet, it is the interrelated effects of these nano-particles and drug contaminants in our environment that may have implications for human health and medicine. Very small amounts of antibiotics are present in natural waters, Peterson points out, originating in part from the livestock industry and sewage treatment plants. Because here is his research’s interconnected bottom-line toward the greater good: The fate of these antibiotics in the environment is a key piece of information toward understanding the spread of antibiotic resistance in human and veterinary medicine. One related to the other, the other related to the one—this is how our world and its people work, from the smallest scientific particle to the largest Christian principle. That’s something Dr. Peterson has always related to. Dr. Jonathan Peterson is the Lavern and Betty DePree VanKley Professor of the Geology and Environmental Science in Geological and Environmental Sciences Department at Hope College. On a scale of sedentary to prolific, the yearlong break away of Dr. Graham Peaslee, the Elmer E. Hartgerink Professor of Chemistry and Environmental Science, can be best described as super-productive. If there was such a thing as barometric sabbatical pressure, Dr. Peaslee crushed it. He registered a patent with the United States Patent and Trademark Office. One last thing, but I’ll wait while you catch your breath…..
Dr. Peaslee co-founded a new company— along with Hope colleague, Dr. Peter Boumgarden, assistant professor of economics, and Hope alum, Evelyn Ritter ’15, a mechanical engineer — called University Market Partners (UMP) Analytical that tests for the presence of perfluorinated alkyl substances (PFASs) in consumer products. PFASs — human-made chemicals found in flame retardant, stain- and water-resistant materials such as carpet, furniture fabrics, textiles and outdoor clothing, cosmetics, fire-fighting foam and even the liner of microwave popcorn bags — are concerning for their long environmental lifetimes, bioaccumulation and toxicity, and thus their impact on human and animal life. Another NSF grant got UMP launched, and NSF featured UMP’s work on its website. Since his passions are the environment and chemistry combined, UMP’s creation perfectly explains where Dr. Peaslee’s newest trek is going. His road is mapped by analytic and nuclear chemistry; his destination is science policy as much as science itself. Those microwave popcorn bags with PFASs? Denmark recently removed them from their grocery store shelves. 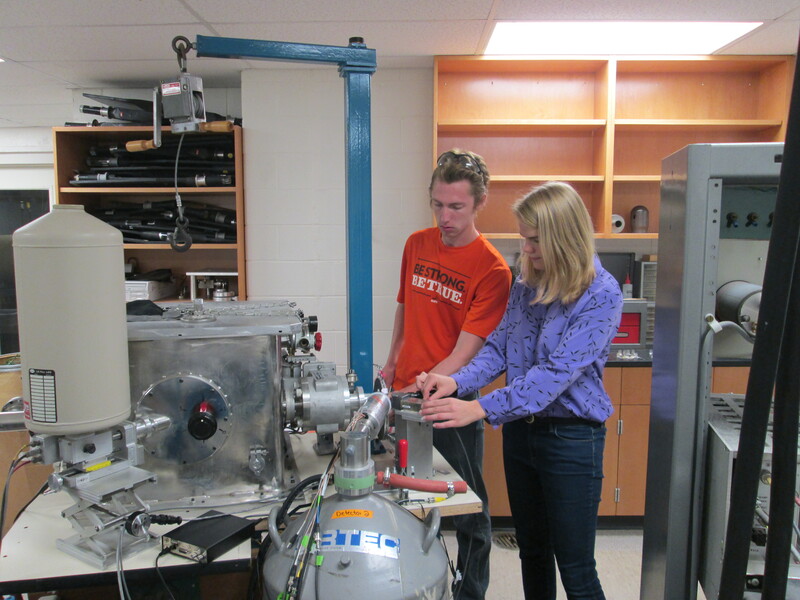 Understandably, Dr. Peaslee would like to see PFASs removed from all food packaging materials in the U.S.
Hope senior David Lunderberg, right, and Evelyn Ritter, a UMP Analytical co-founder, at work in Dr. Peaslee’s lab. Most Saturdays — and any other day of the week, really — Dr. Peaslee can be found with a team of students conducting PFAS testing using the Pelletron particle accelerator, a piece of pricey equipment he acquired with an NSF grant in 2004, in his lab on Hope’s campus. The company’s workers take an existing yet refined nuclear process that Dr. Peaslee and Dr. Paul DeYoung, the Kenneth G. Herrick Professor of Physics, discovered about a year ago and tests for PFASs in minutes when once the testing required days. While paying back colleges and universities like Hope for their accelerator’s use, and giving Hope students experience and employment to boot, UMP is just as importantly able to provide a low-cost PFAS screening method for non-profit groups such as The National Resource Defense Council, the Environmental Defense Fund, and the Environmental Working Group. It’s a win-win-win for Hope, the environment and humans. Of course, Dr. Peaslee’s priority remains teaching and researching at Hope while he runs UMP with his partners. Follow him on Twitter @gfpeaslee. You’ll find his feed full of scientific engagement with students and colleagues, from watershed experiences to cyclotron experiments. Would you expect anything else from a super-productive professor? Dr. Graham Peaslee is the Elmer E. Hartgerink Professor of Chemistry and Environmental Science in the Chemistry and Biochemistry Department at Hope College. Sheep in New Zealand have a friend in Dr. Tom Bultman. And Dr. Bultman, professor of biology, was happy to oblige the massive, wooly industry that is valuable in a country where sheep outnumber humans by about 10-to-1. 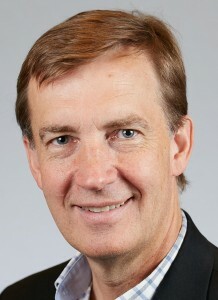 Funded by a National Science Foundation grant and headquartered at AgResearch just outside of Christchurch, Dr. Bultman spent three months in the spring of 2015 investigating the growth and effects of endophytic fungus inside perennial ryegrass, the mainly foraged food source found in New Zealand paddocks. His research findings may eventually ensure that New Zealand’s ovine population (and America’s too) can eat their meals toxin-free. Dr. Bultman and associates also looked at the alkaloid levels — the presences of nitrogenous compounds — in damaged grass and the insect impact on that grass as well. In other words, when ryegrass is walked on by sheep hooves or torn by the sheep’s teeth, what alkaloid, if any, would be produced and how would insects respond to it? “We found that one variety of fungus actually produced reduced alkaloids in damaged grass, probably due to the sheep’s saliva,” Dr. Bultman says. So in layman’s terms, sheep spit is actually a good thing. 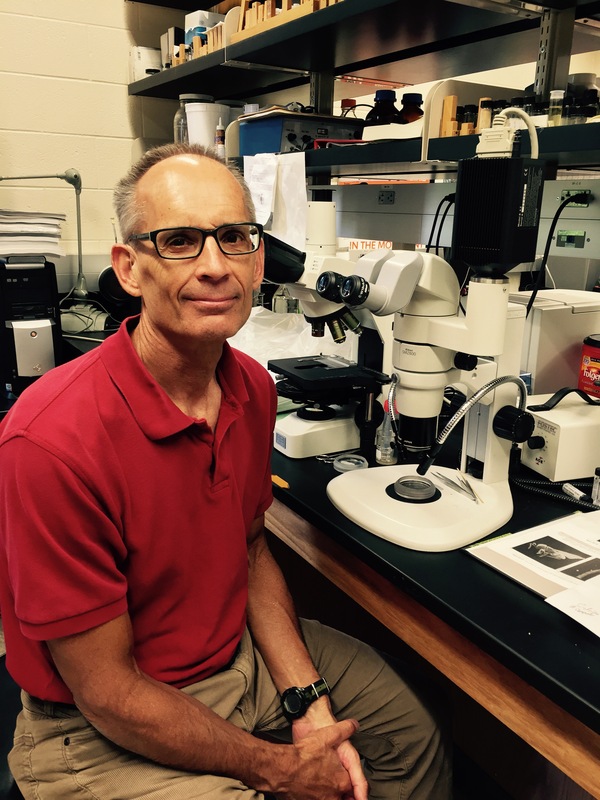 With most of his findings in hand, Dr. Bultman will now begin to author his work for publication in scholarly journals such as PLOS Biology. In fact, he’s anxious to do so. Dr. Tom Bultman is a professor in the Biology Department at Hope College. 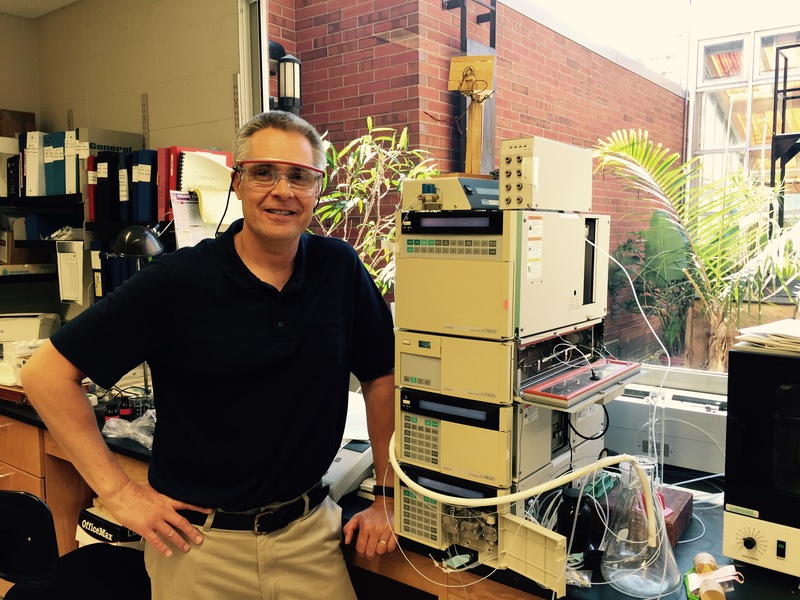 Dr. Jeff Johnson is an award-winning Hope College chemist with a complex sounding research focus — carbon-carbon single bond activation and the development of transition metal catalyzed methodologies. Yet, here is the simplest fact of the matter: Dr. Johnson’s research and teaching agenda— for which he is a winner of the prestigious 2015 Henry Dreyfus Teacher-Scholar Award — is creative, ambitious and elementally fun too. 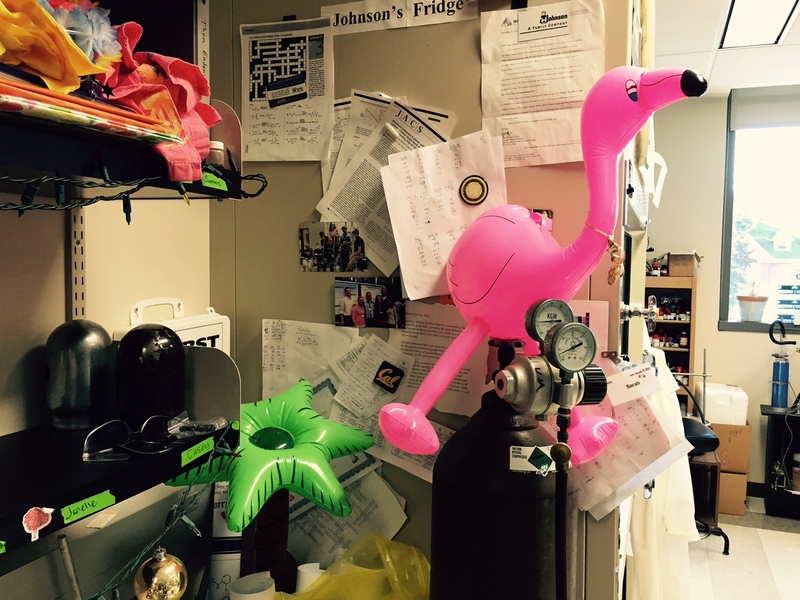 You see, in Dr. Johnson’s laboratory, carbon-containing molecules AND an inflatable pink flamingo can effortlessly cohabitate without pretense or hesitation. Both are indicators of a researcher and teacher serious about organic molecular demolition and Hope student education. Welcome to Dr. Johnson’s office. Mind you, it’s not that an intensive, 10-week, 50-hour-per-week summer research program isn’t fun in and of itself. 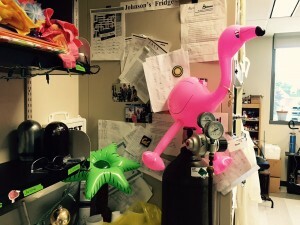 Sometimes you just need a pink flamingo around to lighten the mood. 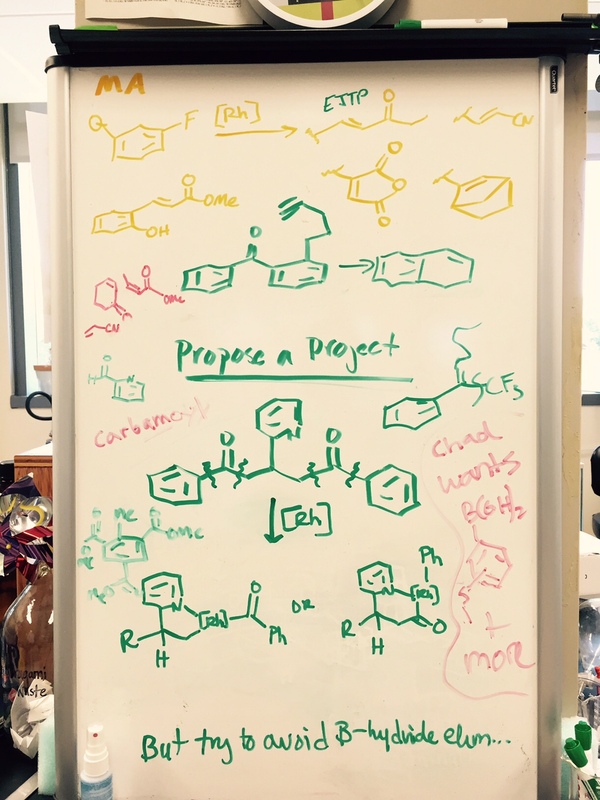 The hard, fun work in Dr. Johnson’s lab centers around the development of new methods of taking a variety of larger, organic molecules and chopping them down. This is done with the potential of testing those lopped-off parts for biological activity. It’s a very difficult and intricate process that could eventually have application in the pharmaceutical and agrochemical worlds, for instance. More than 50 students have come alongside Dr. Johnson in his lab since he arrived at Hope in 2007, with (another) celebrated Dreyfus award in tow (for faculty start-up). Since then he’s accumulated more than $1 million in funding from the National Science Foundation, the Research Corporation for Science Advancement, the American Chemical Society, and of course, the Dreyfus Foundation. A number of those 50 students have advanced onto present their findings at national conferences or co-authored articles in professional journals as well. And in a show of both fondness and pride, Dr. Johnson displays eight years’ worth of Hope student-researchers’ group photos in his office, very near those of his three young children, a remembrance of the bonds made in relationships if not in carbon. While Dr. Johnson guides his students’ researching process, he gives them room to lead, too. 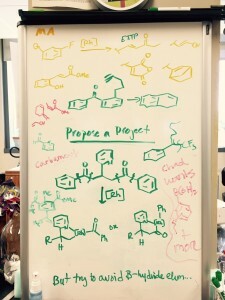 His student-researchers can “propose a project” and hash it out on a dedicated whiteboard. Like his use of theme week, Dr. Johnson puts an emphasis on student creativity and engagement to enhance excitement and dedication. 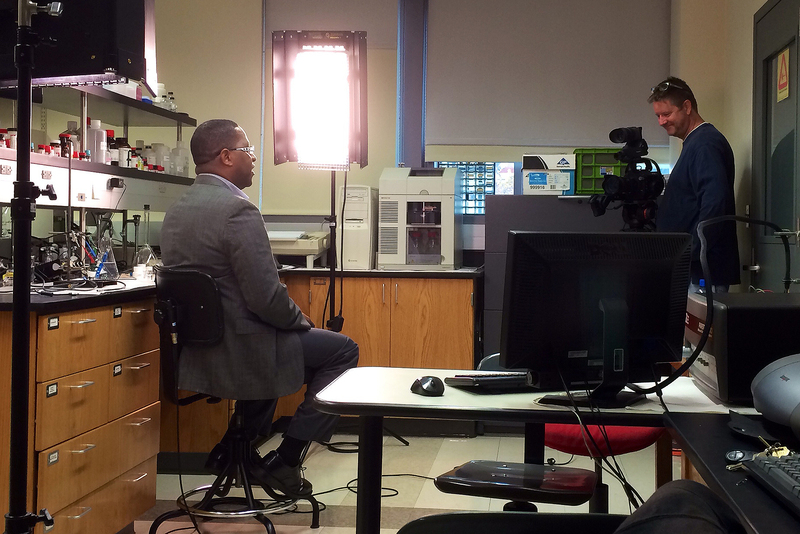 The former musician in him (he played the trumpet and tuba through college) can’t help but give students the chance to appreciate the sound of carbon molecules falling to pieces. That and it’s okay to have a pink flamingo, too. 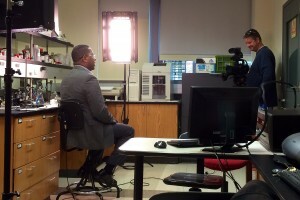 Dr. Jeff Johnson is an associate professor in the Department of Chemistry at Hope College.